Lenovo might still be a little sore from the Superfish scandal that recently rocked its PC division, but thankfully the company's mobile arm has remained unharmed. And that's a good thing, because it's kicking off Mobile World Congress with the announcement of not one, not two, but three new tablets, in both Android and Windows flavors. 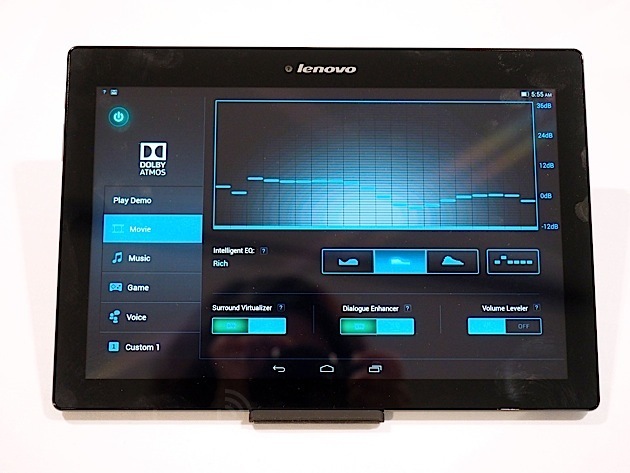 The Lenovo Tab 2 A10 and the Lenovo Tab 2 A8 are from the budget-friendly Android A series, while the affordable Lenovo Miix 300 is for those who prefer the operating system from Redmond. The overarching theme of all three of these is simple: value. But just because they're affordable doesn't mean these tablets are shy on features. 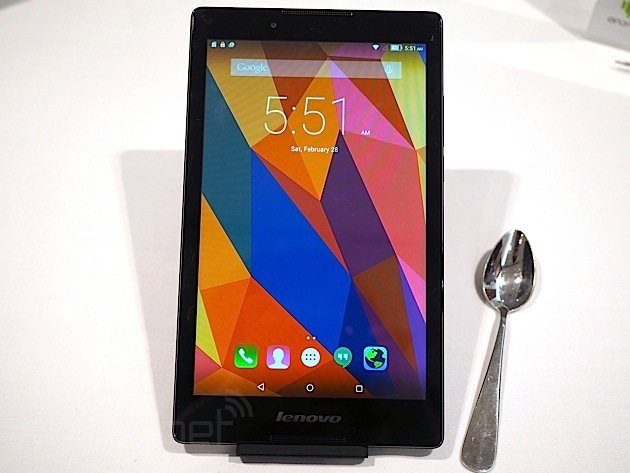 The highest end of the lot is the Lenovo Tab 2 A10, which is also the one that's most focused on entertainment. Not only does it have a nice 10.1-inch full HD IPS display for watching movies, but it's also equipped with Dolby Atmos technology and a multi-speaker soundbar to really give you that theatre experience. In a brief demo of the tablet, I thought the surround sound was remarkably good considering its compact size -- it's not too hefty at 509 grams and it's about 8.9mm thin. The speaker soundbar sounded far richer than most tablet speakers, though using headphones would still result in better audio quality. It ships with Android 4.4 KitKat (it'll be upgradeable to Lollipop later this year), runs on a quad-core MediaTek processor, has dual-band WiFi and sports an 8-megapixel camera. Markets outside the US will get an LTE version of the tablet as well. As for the battery life, Lenovo is promising up to 10 hours of charge thanks to the 7,200mAh battery. Next on the list is the Tab 2 A8, which is very similar to the A10 except it's, well, smaller. It has an 8-inch HD IPS display instead of 10 and is, of course, lighter at 360 grams. The Tab 2 A8 also comes with Dolby Atmos, but it would be better to experience it through headphones since the A8 lacks the A10's powerful speakers. Other features of the A8 include a MediaTek quad-core processor, a microSD card slot that accepts up to 32GB cards, a 5-megapixel rear camera and dual-band WiFi. Interestingly, the international variant of the Tab 2 A8 comes with a dual-SIM card slot for those who like to hop between carriers and it supports both voice and LTE. Yes, that means you could potentially use the 8-inch A8 as a phone. Holding it in my hand, I don't think I could imagine hoisting this next to the side of my face, but I imagine you'd only make calls with this thing with a headset. It has quite a bit of bezel surrounding the display, which I'm not a huge fan of, but the sharp and colorful high-def screen makes up for it. Another great feature of the A8 is that it ships with a pure version of Android 5.0 Lollipop, which could be why performance was relatively zippy when I played around with it. Last but not least is the Miix 300, which almost seems like the last kid picked for team sports in this particular grouping -- it's just not quite as cool as the other two. Then again, the Miix 300 is intended to be the most budget-friendly Windows tablet (a lower-end version of the Miix 2) from Lenovo yet and its humdrum design reflects that. Still, it has a decent 300-nit, 8-inch HD IPS display, an Intel Atom quad-core processor, a 5-megapixel rear camera, 64GB of internal storage, a microSD card slot and, of course, WiFi. You also get a free one-year subscription to Microsoft Office 365 as part of the package. 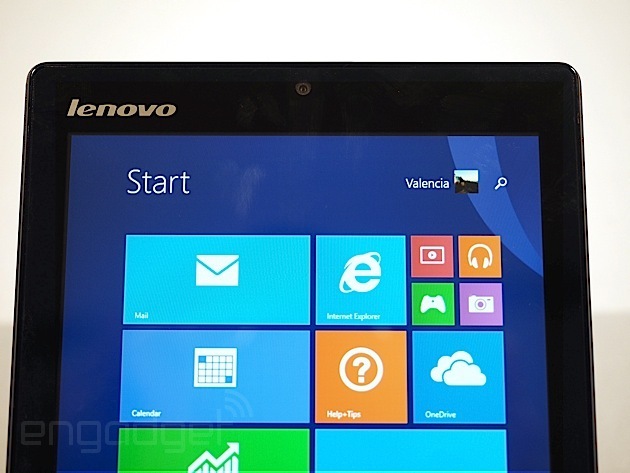 It ships with Windows 8.1, and a Lenovo spokesperson tells us that it should be upgradeable to Windows 10 when that rolls around later in the year. The Tab 2 A10 will be available in pearl white and midnight blue and will ship for $199 starting in April. As for the Tab 2 A8, that comes in pearl white, ebony, midnight blue and neon pink and will be available in June for a starting price of $129. International models with the dual-SIM card slots will cost roughly $179. Finally, the Miix 300 lives up to its affordability promise with a low, low price of $149, which makes it the cheapest Windows tablet in Lenovo's lineup. The Miix 300 will be available in July.